I'm about to start a heavy-duty penciling session for my graphic novel project, and I was planning on doing so while listening to some good drawing music, but I ran into a leetle problem. The cover's been popping off for months. I don't know how I didn't manage to lose it in Europe. Usually I just stick it back on, and it'll stay put for another week or two. 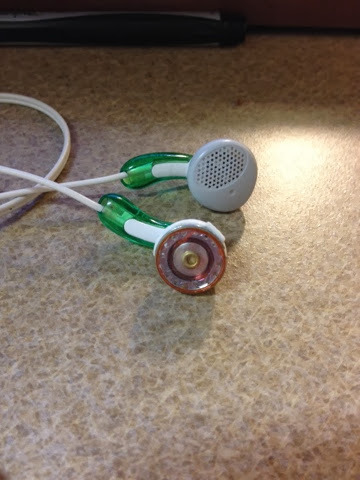 I guess I was always too cheap or lazy to buy new headphones. This time, however, I don't know if I'll ever find the cover. It's lost in the pigsty that is my room. Maybe I'd find it if I cleaned up... Or maybe the cover actually did fall into the trash can like I hoped it didn't. Who knows? Not me. Yes, I could clean, but I think that instead I'll just consider this a sign that it's time to buy new headphones. In the meantime, I found a set of headphones that one of the airlines gave me last summer in my backpack. I knew there was a reason to keep them! Did you look in your ear? As a matter of fact, I did. Though only because I didn't know where else to look. I can always feel it when the cover gets stuck in my ear... Thanks for reading!